Raises and balances body temperature. Makes health and happiness naturally. Takes charge of his or her own health. Cares for others and the planet. What's the secret behind being a Solar Body? It's a matter of degrees. Raise your body temperature with your head cooler and your abdomen warmer and you'll improve the state of both your body and mind. Studies have shown that keeping your body temperature on the higher level of the normal range improves immunity, metabolism, circulation, mood and your optimism! You can do it simply through breathing, movement and your mind’s observation. As part of nature, we have a powerful natural healing system inside. It comes from the stillness, balance, and harmony that exists within all of us. If this system works properly, health and happiness become the most natural state of life. However, it is often suppressed by sustained stress. By removing obstacles to accessing your natural healing power, you can restore your full capacity for health and happiness, naturally and sustainably. Sustaining oneself with his or her own natural processes, a Solar Body shines brightly with health, vitality, a sunny attitude, sparkling eyes, radiant skin, and a glowing spirit. In today’s specialized society, when something goes wrong with our health, we often turn to experts. We forget that the first person we should go to for our health is ourselves and our own natural healing power. A Solar Body looks inside themselves to see what’s really going on, and works to strengthen their body’s natural balance before looking outside of themselves for help. They are strongly centered in themselves, and do not blindly hand over responsibility for their life to someone else. A Solar Body believes in themselves. Listen to this brief explanation by lifestyle artist and blogger Aileen of Lavendaire. I teach other healthcare professionals and help them open their eyes to the benefits of the Solar Body Method as essential Integrative medicine, especially for the area in which I have expertise, chronic pain. For me personally, a cancer patient on life-long chemotherapy, it re- activated my hopefulness that I will be able to continue to rely on my body’s self-healing systems going forward. My experience with this training, . . . has given me physical power and a deepened awareness of my mind-body integration. The Solar Body is an excellent book for restoring your natural healing system. It gives simplified explanations about the methods and it is also a book of self empowerment. It is a comprehensive guide and reference for optimal health. Until last year, I had quite a few health issues, such as eczema, poor digestion, cold hands and feet, wrist pain, chest pain, back pain, shortness of breath, and sleep apnea. I was getting really frustrated, as I was doing a really healthy diet as well as regular exercises, but nothing seemed to work out. Not knowing what to do, I was almost in despair. Then I found Solar Body exercises. Not only did my all symptoms disappear, I became more peaceful and happier. Everyone can benefit from these simple exercises by simply spending thirty minutes a day. I feel very happy since I started the Solar Body Method in May 2015. My mind became sharper, and I have better concentration and more energy for my daily office activities. I personally recommend The Solar Body because it has the technique that helped me to understand that you can establish a new connection between the brain and your body. Solar Body exercises have made me more aware of my breathing, which earlier I was not mindful of. I think it can help other people, especially elderly people, improve their breathing, which in turn improves lung function. It can also help manage sleep disorders and depression, which is very common in aging populations. This method of natural health should lessen the medication load of elderly people already on so much medication for multiple conditions. I have been working as a registered nurse for the past 8 years. Nursing is a demanding job physically and mentally and the Solar Body Method has truly made a positive impact on my life. The method is so simple yet so effective. Plate balancing helps to open all of my joints and increase the heat and energy circulation throughout my body. My upper body becomes so light and graceful, and I feel the power within my core and lower body. During this moment, I'm connected with my mind and body and allow myself to follow the energy I'm creating. Afterwards, my body feels relaxed and energized at the same time. It truly has helped with my daily stressors and I'm able to share these experiences with my friends and coworkers. They too have been able to feel the energy within their bodies after 5 minutes of demonstration. Solar Body exercises have helped me tremendously with joint pains, breathing easier, and being able to relax and sleep better at night. These days, I get out of bed in the morning without the aches and pains I used to have. As a Body & Brain center manager and yoga instructor, my members leave the class feeling a lot of relief from headfulness and joint pains. They breathe easier and report many more benefits, and are a lot happier after class. The scientific explanations of the benefits of the exercises make it easy to understand their benefits. The book is so well-written and easy to follow. I recommended it to my patients. The Solar Body Method can help eliminate unnecessary tests and medication treatments, and therefore reduce high medical bills. It will also help the public to be more aware with their health conditions and be more motivated to participate in their health care. Solar Body Exercises are a tool that I have used to create deep transformation in my life. My brain and body have a deeper connection, and I feel very confident in the choices I make and the daily actions I perform. I am able to see the wide benefit of my life in relationship to other humans and the Earth. Having a Solar Body is life-changing! I hope everyone is able to feel the benefits of the Solar Body. I am a 53 yr old woman who has practiced various forms of yoga since her teen years. I found the book fascinating in its explanation as to why western medicine alone is not working to "heal disease" and how our own bodies innately can heal themselves given proper expression. The exercises are simple, yet challenging, and I experienced immediate positive results in my own mental, physical and spiritual health. The Solar Body exercises improved my general health (physical and psychological) and increased my stamina. It can especially help patients with asthma to breathe better and improve lung function. It can also improve the general well-being of the public overall. I would recommend others to read this book. I have been practicing the Solar Body Method for almost three months, after my physician recommended I try Tai Chi to help longstanding spine pain. Not only am I starting to feel better physically, but the mind-body connection has become clear to me and is as helpful as pain reduction. Speaking as a psychotherapist, I know this deeper understanding will enrich my work with my own patients. I plan to continue practicing the Solar Body Method as I continue my efforts to strengthen my spine and improve overall wellness—as well as enhancing my personal and professional growth. As most dentists, I have suffered with chronic back pain for many years. I had shots done to my back several times, which only worked for a brief period of time. I had even considered spinal surgery. Then accidentally I came across The Solar Body. I fascinated me, so I started to look for a place where they would teach it. I found one and within one month I noticed the decrease in pain in my back. It has been nearly 6 months since I started to practice, and I am practically pain free. More than that, as a side benefit, I sleep much better and am in a much better mood! I highly recommend this method to everyone who is looking for an alternative to a surgery, or who just want to learn about the healing ability of his/her own body. a sample of the method that will help you become solar. If you like them, pass them on. and relax your mind. The vibrations heat up your body to help it go solar. Activates the whole body with a flowing infinity movement. Strengthens the legs, pelvis, core and foot reflexology points. Relieves stress and restores the optimal energy balance. become warmer while your mind becomes quiet. wellness and rejuvenating every cell. As your temperature rises, so will your health and happiness. It only takes a few minutes to warm up to your natural health. Try it and experience the results for yourself right now! 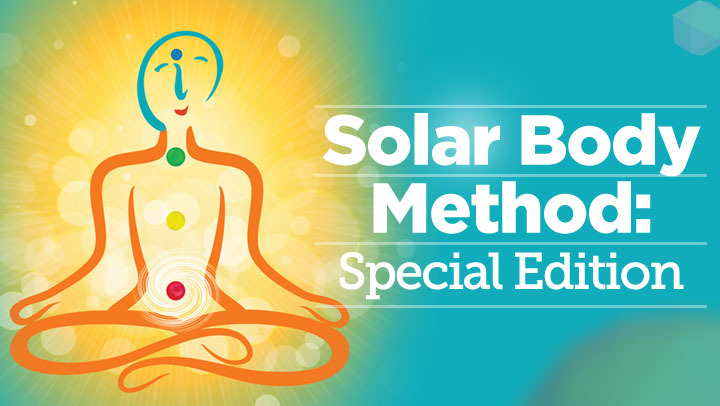 The Solar Body Special Edition online course on ChangeYourEnergy.com is the most convenient way to learn the Solar Body Method. You can stream or download its videos from any device, and can even download the text and audio. The course is based on Lee’s book, The Solar Body: The Secret to Natural Healing. A founder of mind-body practices with phenomenal success, in his book, Ilchi Lee details this remarkably simple method for recovering your innate sense of perfect well-being in every part of your life. Like the sun that self-generates life-giving energy without fail, with this course, you can craft your body into a Solar Body that radiates glowing vitality, positive energy, and limitless creativity. Tap into the secret to becoming a Solar Body and live a thriving life. Ilchi Lee is a New York Times bestselling author and an innovative leader in human brain potential development. He has authored 37 books including Change and The Call of Sedona. A true believer in the power of each person to change themselves and the world around them, he has developed many mind-body training methods, including Body & Brain Yoga and Brain Education. His methods have helped millions of people find their true potential and develop it for helping others. When I discovered the Solar Body exercises, I realized the vital life force power of the sun could be harnessed, thus I'd never have to walk without it—regardless of where I am geographically. The training has helped me realize in my own life what's truly possible once the power of the sun is ignited deep within. I went over my limits and conquered my fears and owned my pain. . . . I am learning to reconnect to the energy source and remembering my mission on this planet as a human being and as an artist. When you become a Solar Body, you feel vibrant from the inside out, your skin glows radiant, your eyes shine with enthusiasm, and it feels oh-so-good to be alive. It has dramatically helped me with my severe sleep apnea. From a professional standpoint, I am seeing great improvement in my patients' issues with overweight, blood pressure, arthritis, spinal problems, muscle spasms, insomnia, stress, and, last but not least, anxiety and depression. I have become increasingly aware of my body and my thoughts . . . . I feel stronger, fitter and healthier of mind, body and spirit, and I am also aware that my future well-being is in my hands and nobody else’s. It completely re-framed the way that I understand my health . . ., which gave me the power to give my body what it really wants instead of a substitute . . . . This change in perspective organically led to a 85-pound weight loss within in the first six months. Want more guidance for learning the method? Get more detailed directions or follow an instructor. Get the Course + Book for 62% Off! now you can get it for just $38. And we’ll send you The Solar Body book by creator Ilchi Lee for Free! Are you loving the Solar Body Method and want to spread the word? Tell your friends and fans on your favorite social media sites with hashtag #SolarBody! Click to join the Solar Body Community Facebook Group! © 2015 Vortex AMC All Right Reserved.